I spent a lot of time in my sewing room today. 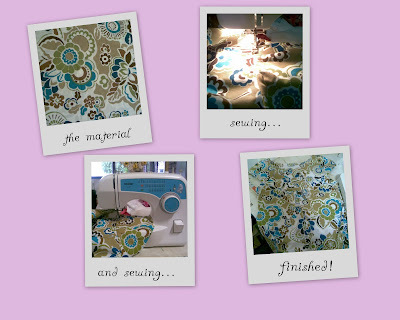 My sewing machine was finally fixed and because of my rotator cuff injury, I was trying to take it easy on my shoulder. Sewing is one of the few things that doesn't make it hurt worse. I started and finished this top in one day. I just love the material, because it reminds me of a good friend. Turquoise makes her smile. L"
I have another blouse cut out and ready to sew, maybe I can do that one tomorrow. Now I'm pooped! Going to take a shower and relax. Good night! Posted by the Chacogirl at 8:58 p.m.
Just A Mom (Call me JAM for short) February 10, 2010 at 10:23 p.m. I love that print too! It's going to turn out great! Shilo February 11, 2010 at 8:22 a.m. Girl, you kill me! You just whipped up a shirt in a few hours. Oh and after a good nights sleep, you're going to do another. Sigh. Amazing is what you are! I love that pattern and ooo...perfect vintagy fabric too! Can't wait to see it on ya!